Never let your Sky Direct cable run out of load, continue watching your favorite HBO movies, NBA games, teleserye, news, box office and more by quickly reloading your box using your prepaid SIM card. No need for you to visit your Sky Direct retailer every time you reload your cable TV by simply using your mobile SIM under Globe, TM and ABS CBN Mobile. You can load any prepaid plan you want, see Sky Direct Plans and Channels (HD and SD) to know more details. Load variant starts at 99 pesos with 4 HD and 21 SD, for Plan 250 you’ll get 6HD and 26 standard definition channels and lastly, Plan 450 has 9 HD (high definition) and 31 SD. To load you all you need to remember is the keyword, BOX ID and access number where you need to send the format thru SMS text. To convert your load just follow the instructions below using your Globe, TM and ABS CBN Mobile SIM. Reply YES SKY99 then wait for the SMS notification. Turn off your SkyDirect digibox for a few minutes then turn back ON. Based on my experince, it takes 1 hour to activate the channels on your subscribed plan. Note: Better ask your load retailer for Sky Prepaid load or you can buy Sky Prepaid card then activate it using your sim card. Users commented below are having problem with loading using a regular on their prepaid SIM. Lightly scratch the card to reveal the PIN code. Text SKYLOAD (space) BOX ID number (space) PIN send to 23667. For those who want to know about your digibox prepaid balance you also text SKYBAL (space) BOX ID send to 23667. You can find your ID on top of your DIGIBOX, please take note of those digits as you will be using it every time you reload and subscribe to pay per view live sports, KBO box office and more. For the best viewing experience on SKY Direct HD channels, you must have HD ready LED TV or Smart TV. 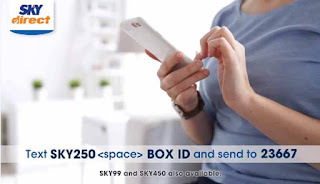 To know more about Sky Cable and all this detail you can visit their website or navigate to Channel 1.
try to txt SKYBAL BOX ID to 23667 in order for you to confirm if your plan is already activated. ganyan ginawa ko . i tried loading my sky prepaid. i loaded regular ₱100 on my globe prepaid sim card andbregistered.. i received a text confirmation that i successfully registered to sky blah blah blah.. but i still cant watch the channels inclusive in that plan.. the customer service rep told us that it should be the prepaid sky load. not a regular load the the regular load deducted to me cannot be reimbursed.. what kind of service is that! they should not take my load in the first place if it doesn't work like that!!!! I loaded regular 255 on my globe prepaid sim and registered to SKY250 send to 23667, there is a message that to confirm text YES to SKY250, the problem is i only texted YES, the load was already deducted but there was no channels. I went to sky direct office and the rep told me to go to globe, I went to globe office again and told the problem but the answer is I successfully registered so it re downs to sky direct. I went back to the office, but the answer is that they cannot trace on the account, because I did not use the prepaid card. They should have not teach me to use the load, if they don't know to give answer or solve the problem in cases like this. Gusto ko subukan yunh sky250 kya lang nabasa ko mga comment nyo nkakatakot nman sumubok. Sasakit lang ulo nyo sa load conversion ng skydirect. Na try ko na lahat globe tm at abs cbn sim to load ang aming skydirect digibox pero ayaw tanggapin ng system nila puro "unable to process please try again later"... Kainis talaga sayang ang load. Kapag tumawag ka pa sa hotline nila isa-suggest na "mas ok po kung sky prepaid na lang gamitin nyo para direct loading" kainis talaga kasi WALANG MABILING SKY PREPAID CARD KAHIT SAAN SA MGA NASABING PARTNER OUTLETS NILA kaya sumusubok kami sa load conversion kapag walang mabilhang sky prepaid. Minsan di pa date ng expiration nawawala na subscription kahit postpaid ganun din. Done.. I HAVE SUCCESSFULLY CONVERTED my Globe prepaid load to sky direct.. Thank you for this blog.. God bless.. I just figured out mine. If you're using a prepaid globe sim, you have to load it 1st in your globe sim. Then type SKY99 (space) BOX ID then send to 23667. Once you receive a confirmation, just reply it with YES SKY99. You will then receive a confirmation that it has been activated. I have the business po to load a skydirect now my question is if load like fro example sky250 I register pa po ba yan ni client? Well n try n po kc nila bumili noon ng prepaid card.. they do register.. so my question is kung iregester ba nila p yun if I load them sky250?